A new concept to realize the Linking card effect with no manipulation! 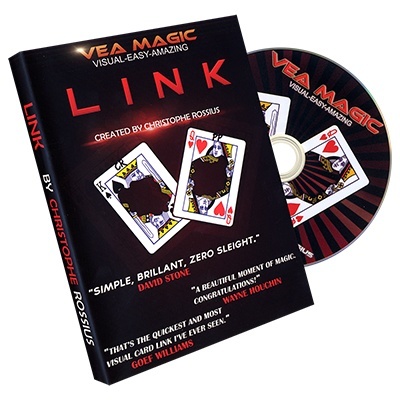 Imagine you have a deck of 52 cards and show them to the audience. You take a card, you fold it in half and remove the center. Sign your initials on the front of the card. You invite the spectator to repeat the same steps with a freely selected card in the deck! So, you have 2 cards with a hole in the center. 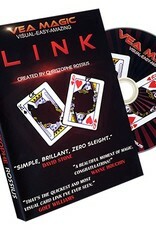 You take these cards and with no sleight the cards are linked! THE CARDS ARE REALLY LINKED! ITS NOT AN ILLUSION! You then perform the steps in reverse to return the cards whole with the initials on same chosen cards! You can give the cards out to the spectators for examination and even let them keep them as a souvenir!